As you probably know, we are not big fans of using back braces to correct postural problems. However, there are uses for them and lifting is one of them. Whether you are lifting in the gym or as part of your job, sometimes it makes sense to add some extra support to your back. How Do You Find the Best Back Brace for Lifting? By doing some homework and listening to what the users have to say about the most popular options. The factors that you need to consider include effectiveness, durability, and price. The first is obviously the most important because if the product doesn’t work, it’s not worth anything. A quick discussion on the function of back braces for lifting is probably useful here. 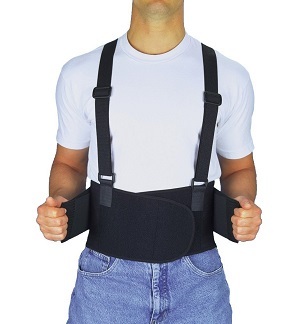 The best back brace for lifting (sometimes called a weight belt), is designed to support your back (usually your lower back) by partly immobilising it. The usual way that this is achieved is by strapping a wide section of partly rigid material around the lower thorax area. We say “partly” because a fully rigid brace would stop the user bending at all and that would be useless. By constricting the mobility of your lower back, the brace makes it less likely that you will over extend a joint, tear muscles, or strain the area surrounded by the back brace. While this sounds good, the flip side is that areas outside the brace are forced to perform differently because of this – which unsurprisingly, can lead to injury there! The other problem is that repeated use of any support product naturally weakens the muscles that are being supported. So When Should You Use a Back Brace for Lifting? There are only a few times when you should consider using a back brace for lifting. The first is if you are a weight lifter, the second when recovering from an injury and the third is if you have to regularly lift heavy weights as part of your working day. Each type of user needs to choose a slightly different best back brace for lifting. 1. Gym users commonly use a back brace (weight belt) when going for maximum lifts. The use here is very specific and a short explanation is that the belt actually provides something for the abdominal muscles to push against which helps stabilise the spine under heavy load. You can read a simple description here. 2. Injury recovery is a different use. In this case you are looking to support an area that has been injured as it heals. The goal here is short term and the actual brace used will be specific to the type of injury. 3. Working purposes is when someone is required to lift heavy weights as part of their working day. Ideally, people will develop strength and flexibility appropriate for the tasks they do each day, but in some occupations it makes sense to protect your back particularly if there is twisting and / or uneven surfaces involved. The best back brace for lifting will depend on your intended use. However, if you do choose one, you need to keep in mind that maintaining a pain free and healthy back also requires commitment to posture, strengthening, and flexibility. The links below will take you to a few of our previous posts that may be helpful.